How Did Your Guardian Angel Learn to Care For You? God has just chosen a Guardian Angel for a baby about to be born. But His selected Cherub isn’t confident he knows how to accomplish all that will be required for this life-long job. “The Cherub was happy, excited and proud, but also afraid; did he really know how to do a big job for an angel so small? But God said, “I’ll help you; don’t worry at all.” Follow the excited Cherub from the moment he is chosen to the moment he falls completely in love with God’s newest creation. 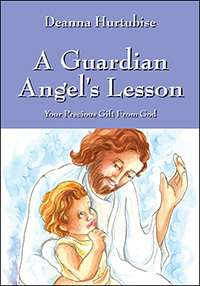 A perfect gift for a Baptism or for a newborn, A Guardian Angel’s Lesson combines touching illustrations and an inspiring story in rhyme that’s sure to delight its readers. Deanna Hurtubise is a French Language and History teacher and author of “So Many Hugs”, a picture book for pre-school children and “The Boys Who Discovered Yesterday”, an historic fiction chapter book for middle school children. She lives in Cincinnati, Ohio with her husband, Paul, three children and eight grandchildren.